Lucky for me, there are PLENTY of tutorials on the Market Samurai website – not only to help you operate the program but also to teach you how exactly to conduct keywords research, competitive research, and so on. Everyone even with basic marketing knowledge and common sense could quickly learn how to make the most out of this tool. It definitely increased the quality of my services and improved my efficiency. Now I use it (along with other samurai’s tools) for my clients’ and my own businesses and I can say it’s an integrate part of my marketing strategies. It offers full range cycle of services when you are starting and/or managing a website – from keywords research, through domain research, blog editorial development and promotion, all the way to rank tracking and competitors’ links analysis. It is easy to use, intuitive, with extraordinary help section of tutorials and other materials, and let’s not forget – excellent support and customer care. Keywords research performed with Market Samurai saves a LOT of time (compared to doing it manually with Google keywords tool and excel – yes, I have done that, too!) and besides – it is good for non-English researches, too. It has a 30-day free trial so if you don’t like it, there’s no pressure to buy it! All new features and updates are included (no payment for new versions) and once you become a paid user with full license for Market Samurai, there’s a pretty good chance you will get occasional offers and preferential rates for the new products of the samurais which are yet to come. Remember that Market Samurai is just a tool – it is still you in the driver seat! Probably it’s obvious but still – better safe than sorry: you should know that purchasing the software will not automatically bring you new job offers or sales. You will still have to find SEO contracts, to analyze the data and to figure out strategies and tactics for rankings improvement. Your success depends on your thinking – on the conclusions you draw and the steps you take. 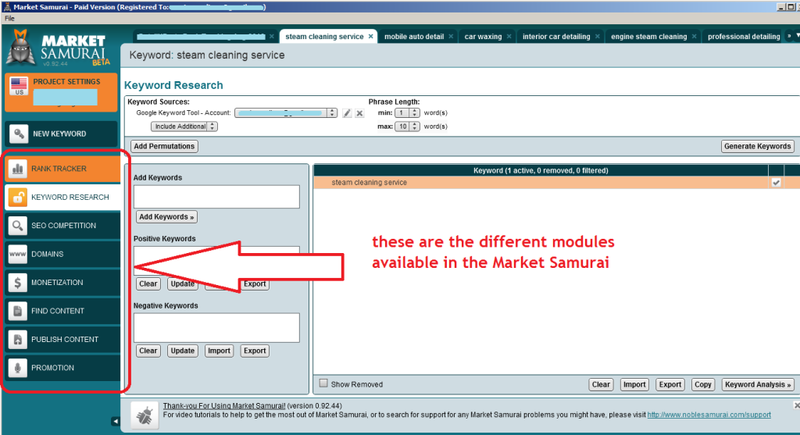 Market Samurai is a great tool (the greatest, actually!) for keywords research and SEO. Whether you are a SEO professional or a website owner, I am confident you will benefit to have it in your arsenal of tools. Start the trial period now! Soon I will review also the Rank Tracker module which was made a paid service not long ago – here’s the post on their blog: Rank Tracker Update – Free Plans & Pricing Revealed.